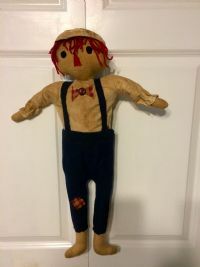 Love the way this primitive Raggedy Andy doll came out. His pants are made from aged blue flannel with straps. His shirt and sailor cap from aged muslin. Sweet red check bow tie and patch on his knee. He has a hook to hang about 23"